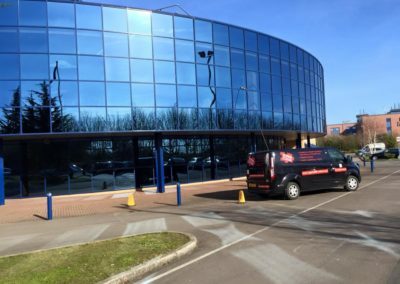 Since first starting out in 1985 our business has gone from strength to strength earning us an enviable reputation of being the commercial window cleaning company of choice in our areas. We have a great client retention rate and some of our clients have been with us from the very beginning back in 1985. 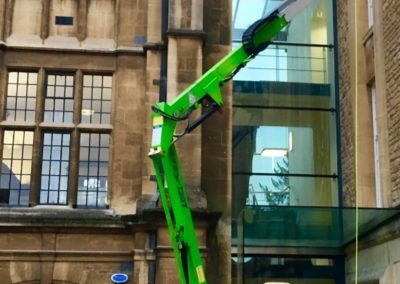 Our aim is to deliver a service which gives you clean windows throughout the year ensuring you and your staff always have a clear outlook from your premises. 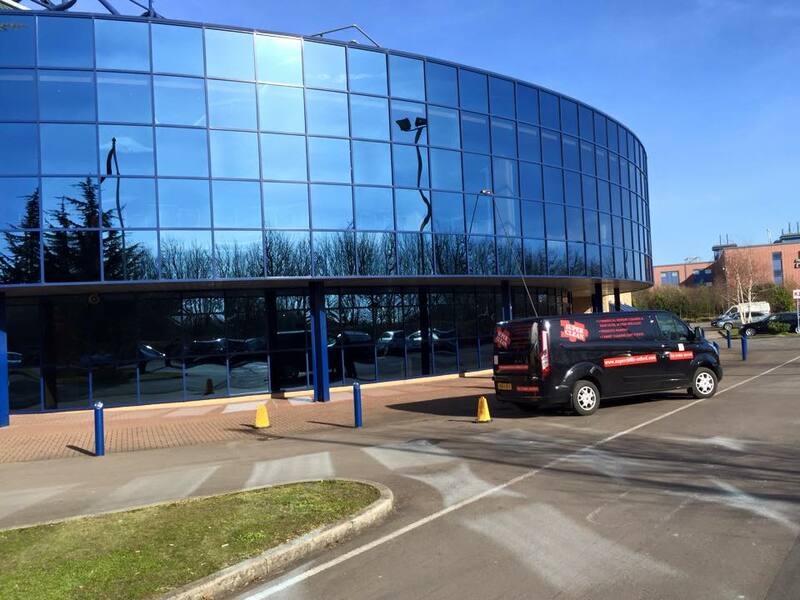 Due to our vast experience within the commercial cleaning industry we can determine the most cost effective and safe method of window cleaning needed therefore offering excellent value for money. We aim to carry out our work to the best of our ability and to the highest standards possible. If you are not completely satisfied, we will return to site a second time and clean the said area for free if you are still unsatisfied we will refund any monies which have been paid. 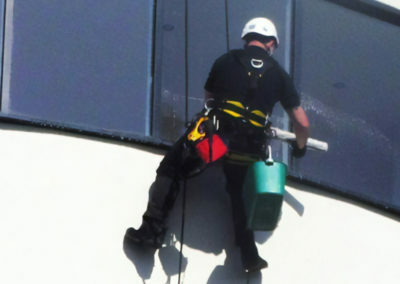 This is our main method of cleaning windows externally as we do not go above 6m on a ladder. 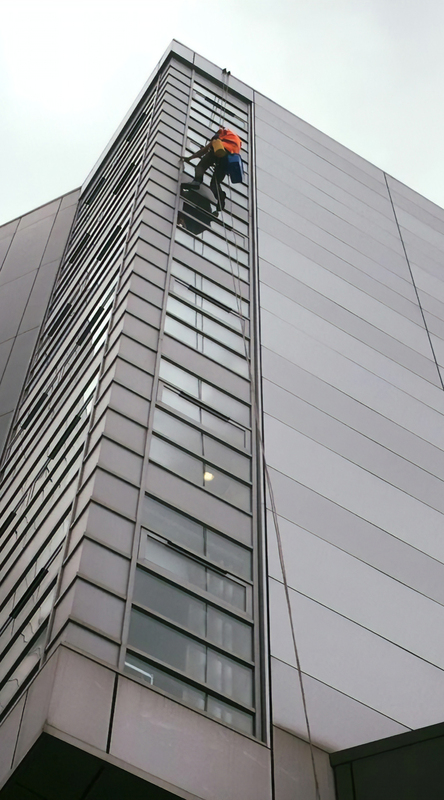 By using 100% pure water, which is then pumped through telescopic poles, we are able to access and clean windows to heights in excess of 65 feet (5-6 floors). There is minimum Health and Safety risk, making it, by far, the safest and most cost effective cleaning method with excellent results. On average, compared to other access methods, we can save our clients over 40% of their total cleaning costs with the use of this safe and reliable system. We are happy to give free demonstrations of the Reach & Wash system which is carried out by our regular staff and not a sales representative. The Reach & Wash System for window cleaning utilises a 5 Stage Water Treatment System and Carbon Fibre Water fed Poles to deliver 100% pure water to the window. The water treatment system utilises Reverse Osmosis and mixed bed De-mineralising Resin to produce 100% pure, Laboratory grade water. The nature of de-mineralised water is to strive to return to its natural impure state by actively absorbing all dirt, chemicals and minerals it comes across. 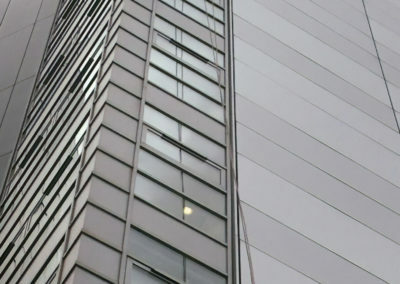 When used for Window Cleaning, provided the correct technique has been used, the final rinse water dries to a perfect finish. In fact the window isn’t just clean, it’s left totally sterile. As no chemicals or detergents are used, the process is environmentally friendly. Traditional window cleaning leaves behind sticky soap residue, which attracts fresh dirt back to the window, while windows cleaned with the Reach & Wash System, actually stay cleaner for longer! Our staff are trained and competent to use a number of different cradle systems and bosuns chairs, which are a permanent fixture of your building. After an on site survey our staff would need to be trained on the specific machine before carrying out any work on your building. We have designated operatives which are trained in the operation of most types of access platform by the leading governing body IPAF. This enables us to safely reach and clean windows which are above 65ft and cannot be reached by the use of the reach and wash system. We also have a number of machines available to use which can be operated internally when tower scaffolding cannot go high enough. Super Clean provides an innovative new approach to high level access work. 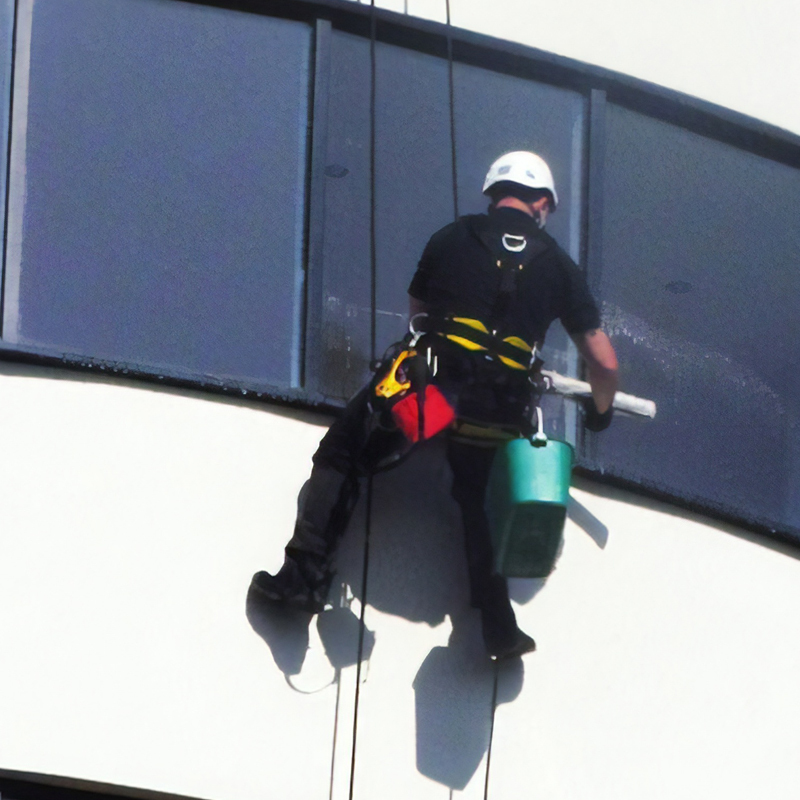 At Super Clean we supply highly skilled technicians who carry out industrial rope access projects throughout large sectors of industry including construction, hospitals, hotels,etc. We offer our customers a comprehensive range of inspections, maintenance and repairs in difficult to access areas and sometimes harsh environments, such as confined spaces and high level access structures. With high level window cleaning there is no competitor to Rope Access. Whether the building has an integral cradle system fitted or not. Rope access is fast becoming Facilities Managers choice of access. This is generally due to the size of budget allocated to window cleaning, and the cost and hassle of yearly maintaining and certifying of expensive mechanical equipment the budget is sometimes swallowed up just on the yearly maintenance and upkeep of the cradle system alone. 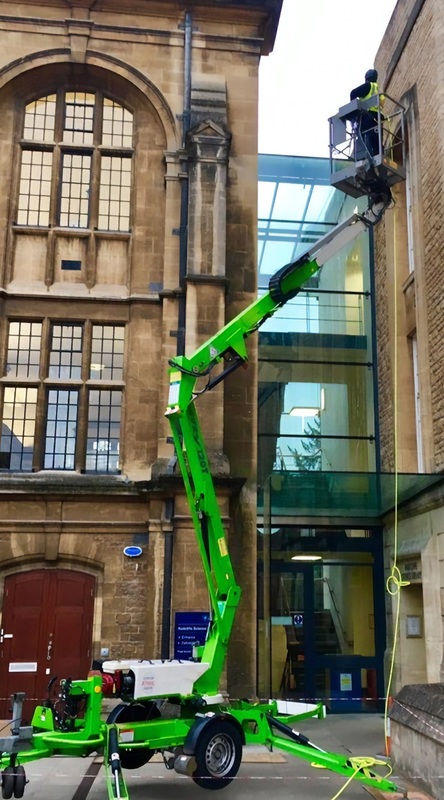 By using Rope Access techniques there is no need for the extra cost of maintaining cradle systems, hiring mechanical equipment such as a scissor lift or cherry picker or even loosing time erecting scaffolding. Super Clean’s rope access technicians are finding that the sole cost of maintaining and running these powered access systems is far often more expensive than the actual project. In many instances external works require access from both the interior as well as the exterior of buildings. Such operations may include window cleaning and in some cases minor maintenance operations. To ensure operative safety fall arrest safety ‘eyebolts’; ‘Roof Anchors’ and ‘ladder restraints’ are the common user friendly solutions. Super Clean South Ltd can supply and install a number of safety anchors (including window cleaner type eyebolts) conforming to Class A1 of EN795 & BS7883. Safety Anchor/Eye bolts are available in galvanised, stainless or plastic coated steel in a variety of lengths. We can also load test these systems and provide a certificate for your records.